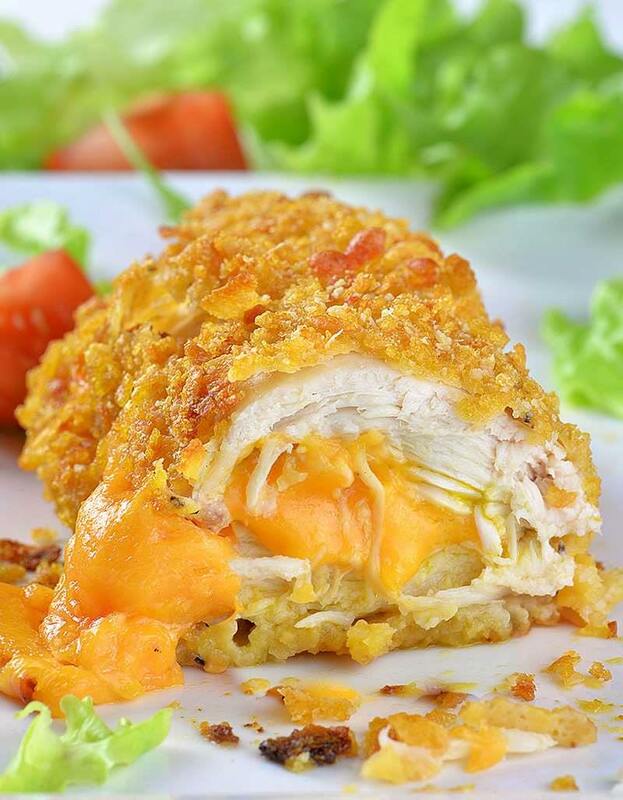 Crispy Baked Parmesan Chicken recipe is QUICK and EASY DINNER for your family. This is simple main dish for weeknight dinner and your kids will love it, too!!! 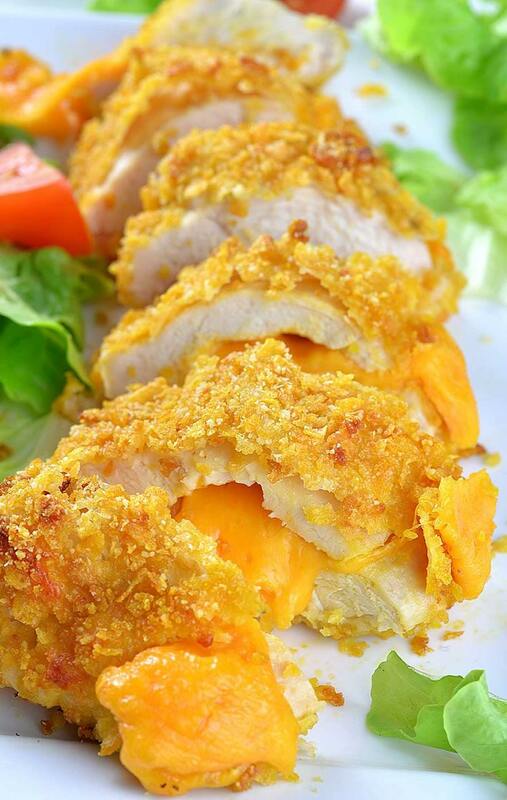 You can make this easy cheesy, garlic parmesan crusted chicken breasts stuffed with cheddar cheese in 30 minutes. Speaking about this Crispy Baked Parmesan Chicken recipe, it’s really delicious 30 minutes weeknight meal. Although these chicken breasts are OVEN BAKED (not fried!!!) they are super crispy on the outside and soft and tender on the inside. Since it’s not soaked in deep oil, this oven baked chicken is HEALTHY RECIPE for family dinner. Crispy Baked Parmesan Chicken is great as a main dish. Also you can add some veggies as a side, or just a salad and dinner is ready for whole family. It’s simple, healthy, quick and easy dinner recipe. As a matter of fact, secret ingredient that makes these chicken breasts super crispy is corn flakes. I mixed grated parmesan cheese only with corn flakes crumbs. Actually, I didn’t want to add any of bread crumbs so I used just corn flakes. To tell the truth, it turned out better than I expected. Moreover, mixture of grated parmesan, corn flakes crumbs and olive oil gives very crispy and flavorful shell. But this is not just ordinary Crispy Baked Parmesan Chicken. I wanted to make this main dish really special, so I stuffed chicken breasts with shredded cheddar cheese. Even though it’s very tasty thanks to garlic, parmesan and cornflakes, I wanted it to be super cheesy and flavorful. Finally, just imagine deliciousness of this Crispy Baked Parmesan Chicken. Baked chicken breasts seasoned with garlic powder and stuffed with shredded cheddar cheese sounds great already. But coated with corn flakes crumbs and parmesan, bake in the oven until crispy on the outside and soft and cheese on the inside, can’t be anything less than perfect. Crispy Baked Parmesan Chicken is QUICK and EASY DINNER RECIPE for your family. Preheat the oven to 400 F. Line baking sheet with parchment paper, set aside. Ground about 2 ½ cups corn flakes in a food processor to make the crumbs, or place in a zip-lock bag and crush with a rolling pin. I prefer slightly coarse crumbs (like panko) to make crispy coating. Sprinkle each chicken breast with salt, pepper and garlic powder on both sides. Stuffed each pocket with shredded cheddar cheese and press to seal. Arrange 3 shallow dishes in a line. Place the flour in the first one. Beat the eggs in the second dish. In the third dish combine cornflakes crumbs and grated parmesan. Stir well, then add olive oil and stir until evenly moistened. Working with one chicken breast at the time, first dip it in the flour on the both side. Be careful to keep the pocket from opening!!! Then dip into egg, allow excess off egg to run off. Dip in corn flakes-parmesan mixture to coat well and place on prepared baking sheet. Bake about 25-30 minutes or until the crumbs are golden brown. I did this chicken for First time tonight had to cook lil longer than 35 mins, just waiting to taste it.it to as quick to make.